Influenced by everything from nature to architecture, jewelry by Karen Bandy of Bend, Oregon, is unique and individualistic as well as beautiful. With design and goldsmithing of the highest quality, Karen’s rings are always one-of-a-kind, and very wearable. They fit your lifestyle, your personality, and become an expression of you. The gems from Karen Bandy Studio are unique, some are so rare most people have never heard of them, and they can surprise shoppers with their unique beauty. They also spark surprise with their affordability. A gorgeous gem can be expensive or very reasonable – it depends on the gem type, not just gem rarity. She can guide you through all the choices from color to clarity to wearability – helping with each step of the decision-making process. The Studio uses recycled white and yellow gold in all of its designs, and if you want platinum that is also often recycled as well. 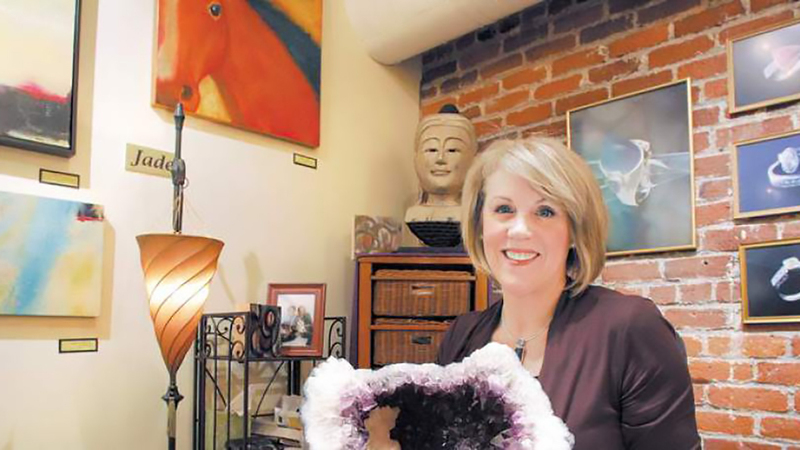 Karen Bandy Studio continues to design beautiful jewelry in addition to creating original paintings and welcomes visitors to their Bend art gallery. The Bandy Studio is open Tuesday, Wednesday or Thursdays 11:30 a.m. – 5 p.m., or by appointment early evenings.